The objective of WP1 is to demonstrate the long-term viability and sustained use of subsurface water solutions, by continuing and expanding reference pilots. SWS have been developed by innovators in the water market, who have successfully piloted the techniques, have gained hands-on experience, and are now promoting the techniques to their peers. These well-monitored reference sites form an excellent basis for long-term SWS track record building and for addressing questions related to scaling-up. WP1 continues and expands the on-going reference pilots, thereby learning about their sustainability and the potential pitfalls. These first SWS applications serve as showcases for the market replications (WP2) and for future applications outside the project (explored in WP4). Besides, the experiences gained provide robust input for the implementation tools developed in WP3. The work in WP1 will be collated in technological and economical guides for implementation of the three SWS. The objective of WP2 is to demonstrate the robustness of SWS and their applicability under different environmental and societal conditions. Up to now, the application of SWS has been restricted to the Netherlands, whereas SWS have the potential to solve water problems in coastal areas worldwide. To accelerate the European and worldwide commercialization, it is important to test and demonstrate SWS applicability in different hydrogeological settings, for different end-users, and under different policy and regulatory frameworks. This will increase confidence in the techniques, and will provide important knowledge on its market potentials and constraints. The Netherlands are a sedimentary basin made of unconsolidated sands and clays, which is the typical geology found in coastal delta’s worldwide (e.g., Northern Germany, the Mississippi delta, Bangladesh, Jakarta). The reference pilots (WP1) have demonstrated SWS applicability in this type of geology. Confined and unconfined carbonates (fractured and/or karstic) constitute another type of important coastal aquifers, and three of the replication sites are in this type of geology. Successful SWS evaluation and replication there will demonstrate the wide applicability of SWS beyond the sandy aquifers of the Netherlands and increase the (worldwide) market potential significantly. In WP2 market replications will be set up through field pilots in Denmark, Greece, the Netherlands and Mexico. Replications will be tailor-made to the local conditions, serving the needs of the local clients, decision makers and other stakeholders. Participatory technology assessments (pTA) with the SWS stakeholder groups will make clear whether SWS provide desirable answers to the local and regional societal and economic challenges. pTAs will be executed in WP3, as part of the SWS Knowledge Base, developed in T3.1. The objective of WP3 is to lower the barrier to the uptake of SUBSOL solutions in different technical and regulatory contexts. Work within WP3 will assist early adopters to (a) identify available options for SWS implementation, understand their key characteristics (from a technical, environmental, economic viability and business perspective), (b) select from the available choices the most promising solutions related to their own contexts and (c) provide a toolkit for developing, placing and modelling new SWS solutions. Furthermore, this WP will nurture the SWS early adopters’ community by providing a virtual market place with linkages to existing networks as well as to tool and technology platforms, thus supporting a community of practice. WP3 deliverables are exploited by WP4 to pave the route to the market; insights and results from WP4 provide input to the tool development in WP3, as do experiences from the WP1 and WP2 pilots. 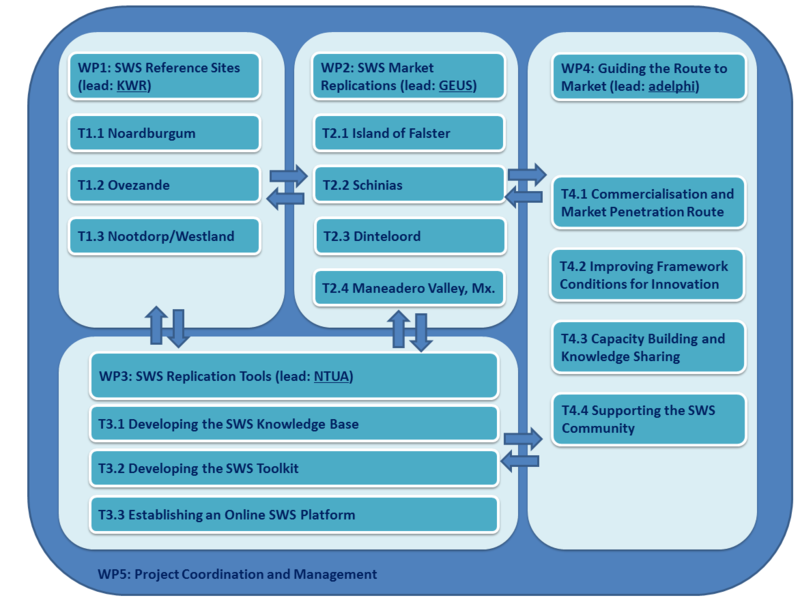 Specifically the WP will produce three main outputs: A web-based knowledge repository (SWS Knowledge Base), a SWS Toolkit that will be available online to all practitioners and an online SWS Platform, whose key feature will be a virtual market place. The knowledge base is there to provide information on what is available, what has already been applied and tested under different contexts, what were the main lessons learned and what are the key legislative and regulatory issues that need to be considered. The toolkit can be used to provide an answer to how SWS solutions can be applied/designed while the market place is the environment in which the interested parties can find out who can provide technologies and solutions for all or part of their problem. Navigation in the platform can take place both from a specific context to a solution to a provider or the other way around: from a marketed/advertised solution to the knowledge base for evidence of its feasibility and then to the toolbox to design for the case at hand. The objective of WP4 is to increase the market reach of SWS and promote their uptake on European and global markets as well as disseminate project results and experiences with the aim of sensitizing potential clients. Despite of major progress in SWS to address water security, broadening their market reach and uptake is oftentimes difficult, in part because understanding and acceptance of these SWS solutions is lacking. WP4 activities are dedicated to address these challenges and to pave the way to the market by developing a strategic promotional approach. This approach is designed to be replicable by SMEs in the water technology sector and can be applied on European and global markets. One key aspect for launching an effective route to market strategy is to focus on relevant regions in the target markets of the SUBSOL project. Market scans are executed in target regions by locally anchored consultancies, making use of the local networks provided by SUBSOLs Associate Partners and the stakeholder groups associates with the reference pilots (WP1) and market replications (WP2). This way, it can be assured that the project channels its activities exclusively to those regions that can potentially make use of SWS technologies. Framework conditions for SWS uptake are assessed, and on this basis, recommendations are formulated both towards policy-makers as well as technology providers. On this basis, targeted commercialization and market penetration strategies are developed and their implementation is supported by the project. Further promotional activities include open access publications, capacity building measures to promote the understanding of stakeholders and trust building measures like study tours, and an informational film about the opportunities that SWS offers.